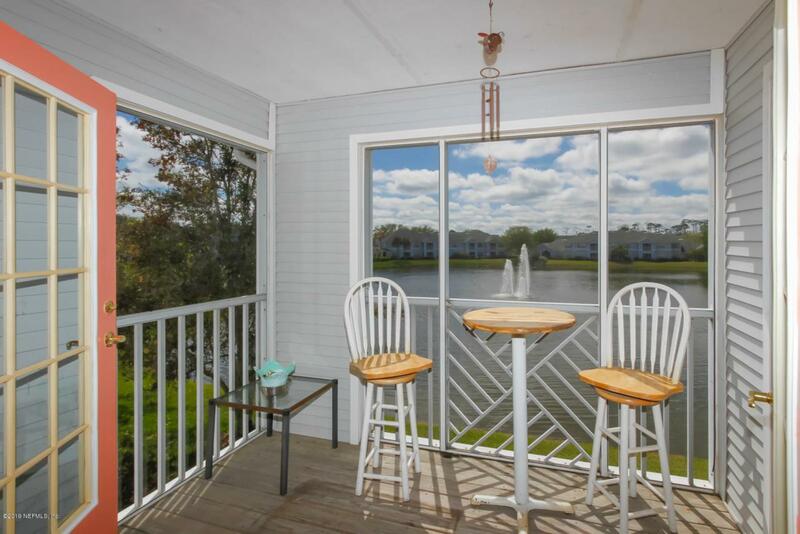 Tropical paradise in this 2nd floor 3 bedroom, 2 bathroom lakefront condo located in The Preserve on Anastasia Island. 1451 sqft of living space with vaulted ceilings. The kitchen is designed with solid cherry cabinetry and an island overlooking the gathering room. Split floor plan. Master bedroom has an en-suite bath with two walk in closets. Double doors open to the screened -in patio so you can enjoy the outdoors with a beautiful view of the lake. Storage room off the patio. Clubhouse, newly resurfaced pool & deck, 24 hour full fitness center, indoor basketball court, business/media center, community boardwalk, picnic & grill area, car wash, boat parking for a nominal fee, playground and more. Close to St Augustine Beach, Flagler Hospital, University of St Augustine and downtownhistoric district. Nearby Farmers Markets, shopping, restaurants, Amphitheatre, St Augustine Lighthouse, Concert Series at the Beach. So much do see and do on the island.